Home » Strong Evidence Shows Extraterrestrials Have Been Shutting Down Nuclear Missiles Worldwide For Decades, But Why? There is no shortage of pictures and videos when it comes to UFOs, here’s another ‘official’ example you can read about from the Canadian military. The quote above comes from Lord Admiral Hill-Norton, Former Chief of Defence Staff, 5 Star Admiral of the Royal Navy, and Chairman of the NATO military committee regarding what’s known as the Bentwaters incident. It’s an incident that took place in Rendlesham Forest, and remains a very important event and one of the most controversial UFO cases ever – because it’s supported by military testimony as well as military documentation. The area houses nuclear weapons, a fact that was denied for years by authorities, but then admitted to be true. The incident at Bentwaters, according to the UK ministry of defence, was described as having “no defence significance.” This didn’t make much sense – how can you tell people that after a Colonel of a nuclear weapons facility and his many men either experienced what they experienced, or all suffered a giant hallucination together, is of no defence significance? Doesn’t make sense, does it? The document outlines how these strange objects had “been seen near military installations by responsible people.” The “responsible people” list is blocked out and states “Limited Official Use,” because the people in question are military personnel. Hundreds of these people have come forward publicly, however, and here is one example. Professor Robert Jacobs (first officer ever awarded with the Air Force guided missile insignia), who was the officer in charge of optical instrumentation at Vandernburg Air Force Base, was responsible for supervising the instrumentation photography of every missile that went down the test range. In those days, the nuclear missiles were called “inter country ballistic missiles” (ICBM’s) because most of them blew up on launch. Their job was also to provide data on why they blew up, so they could provide the engineers good enough engineering sequential photography so that they could see what was wrong with the missile as it took off in flight. In the video below you can also see a recreation of the event. 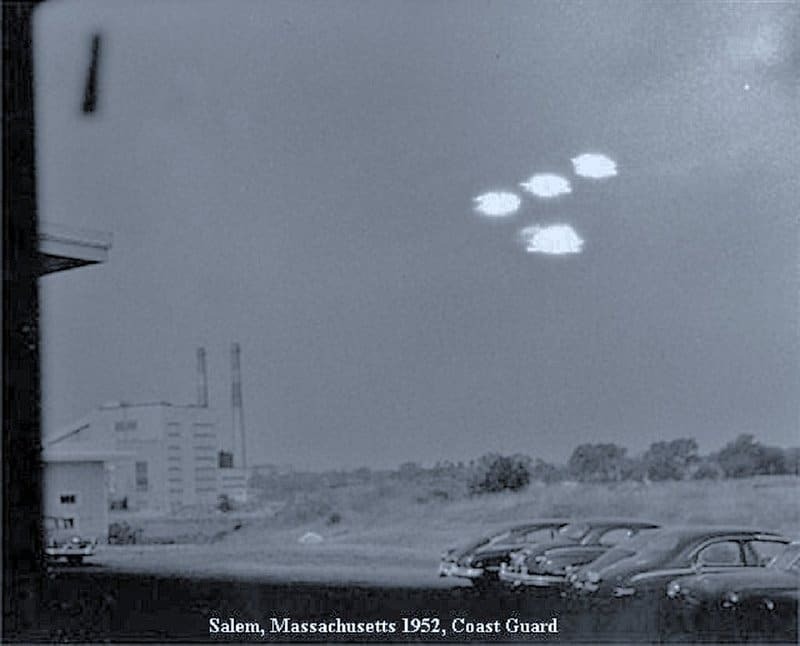 Another incident occurred at Malmstrom Air Force Base in Montana, and is one of the most remarkable events in this history of UFO encounters with the military. This occurred in March of 1967 at a base that was responsible for a large amount of nuclear weapons. Witnesses here saw a red, glowing UFO hovering just outside the front gate. After that happened, all of the nuclear missiles shut down, and went completely dead. Below is a clip of Captain Robert Salas, one of the men involved in the incident, giving his testimony at the Citizens Hearing on Disclosure that took place a few years ago, where a number of academics, politicians, and ex-military gathered in front of several congresspeople to discuss the matter and what happened there. There are many theories out there. When military witnesses gathered at the national press club in 2010, the feeling among them was that these UFOs and whoever they are operated by, are sending a message that we are “playing with fire.” But testimony from another high ranking officer who spent his life working in and around nuclear weapons and nuclear weapons facilities offers up a different explanation based on the information he’s been privy to. After stating the above, he goes on to use the Vandenburg incident (mentioned earlier in the article) as an example, where they photographed the missile and the UFO as the missile climbed into space. Watch the full interview where these quotes were taken, HERE. So, from all of this information we have a few theories. Extraterrestrials are warning us to stop playing with fire and building nuclear weapons, that it’s not in our best interest and we should stop. Secondly, a nuclear explosion is huge, and the energy travels far beyond the physical blast radius and not only affects our solar system, but others as well. Also, as mentioned above, nuclear explosions pollute the magnetic field, something that they rely on to operate their craft. One things for certain, the deactivation of these weapons, along with our willingness to not use our intelligence to create deadly weapons is a must if the human race wants to move forward. Human consciousness is changing, and it is us who must be that change. It is the person working to develop these weapons, seeing through the lies of the justification of making these weapons, and more. Humanity must wake up, and realize that this is a big no no, and, year after year we get closer and closer to more people having that realization. Definitely some interesting things to think about. What are your thoughts? Related CE article: What Happens When A UFO is tracked on Military Radar?